A. The birth of Einstein’s Relativity. In late June of 1905, German mathematical physicist Albert Einstein (1879-1955) finished writing a manuscript that he later referred to as his Special Theory of Relativity (Einstein, 1905d [Dover, 1952, pp. 37 – 65]). This manuscript was written in German and entitled: “On the Electrodynamics of Moving Bodies” (Ibid, p. 37). Einstein previously had theoretically applied the “Galilean transformation equations” to a ray of light transmitting at the constant velocity of c and propagating relative to a material body moving inertially away from the light ray at velocity v. The mathematical result was that Maxwell’s constant transmission velocity of the light ray at c algebraically appeared to vary or change to c – v or c + v, depending upon the speed and linear direction of the inertial motion of the material body (Chapter 19). Thus, for Einstein, these classical Galilean transformation equations of mechanics did not appear to apply to the phenomena of electromagnetic waves. 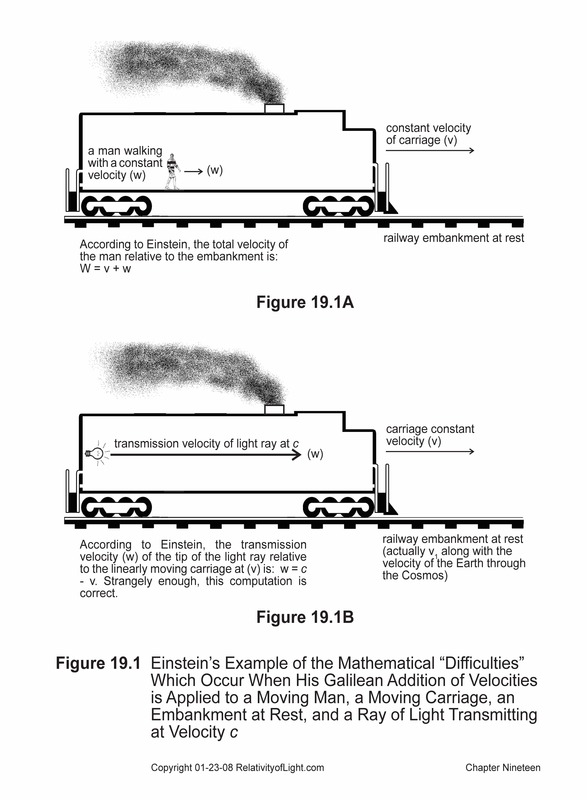 “If every ray of light is propagated relative to the [stationary railway] embankment with the velocity c, then for this reason it would appear that another law of propagation of light must necessarily hold with respect to the [linearly moving] carriage—a result contradictory to the principle of relativity (Einstein, Relativity, p. 23; Figures 19.1 and 19.2). Rather than discard one of these supposedly cherished laws of physics (Galileo’s Relativity or Maxwell’s constant propagation velocity of light atc relative to material bodies), Einstein chose instead to attempt to reconcile the apparent mathematical contradiction between them by algebraically modifying the troublesome Galilean transformation equations of mechanics. He attempted to accomplish this unnecessary mathematical feat by borrowing a different set of ad hoc transformation equations from Lorentz’s April 1904 treatise and substituting it for the classical Galilean transformation equations (Chapter 27). 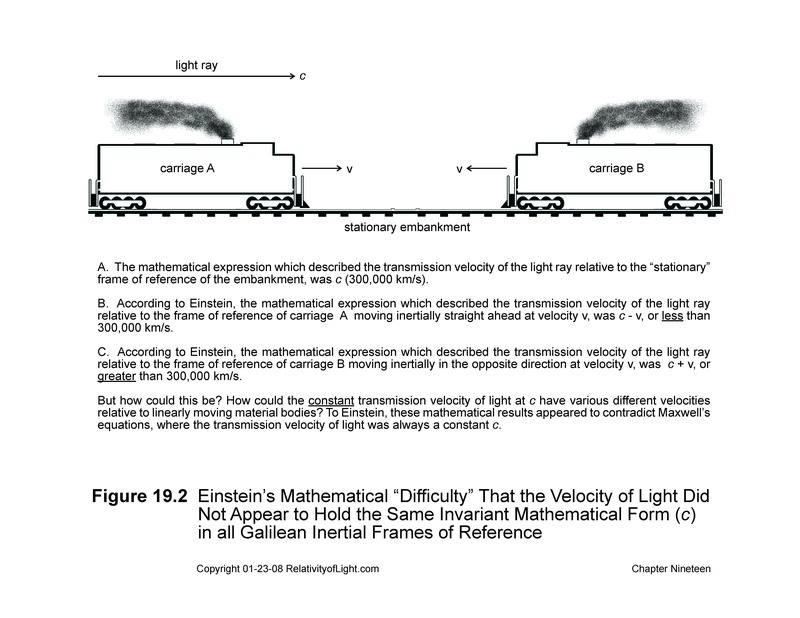 When Einstein then applied this radical new set of “Lorentz transformation equations” to a ray of light propagating relative to the railway carriage inertially moving at v in any linear direction with respect to the light ray, the velocity of the light ray remained algebraically constant at c (the Preamble). In other words, the velocity of light mathematically became an invariant velocity of c relative to both inertial reference frames (the stationary railway embankment on the inertially moving Earth and the linearly moving carriage). Voilá! Einstein’s mathematical fix seemed to work like magic. Einstein attempted to justify the substitution of the Lorentz transformation equations for the Galilean transformation equations, as his artificial solution for the perceived mathematical “difficulties,” by means of numerous illogical rationalizations. Most notably, they were his synchronization of clocks to create a “common time” for all observers and all events on every frame of reference (Chapter 25), and his twin concepts which Einstein called the Relativity of Simultaneity (time intervals) and the Relativity of Distance (length) (Chapter 26). Some of the bizarre mathematical (spatial and temporal) consequences which resulted from substituting the Lorentz transformation equations, and from Einstein’s definitions and rationalizations (which defy experience, logic and commonsense), were: 1) the ad hoc and unobserved physical contraction (shortening) of a material body or object in the direction of its relative inertial motion (Chapter 28); 2) the ad hoc and unobserved reciprocal dilation (slowing down) of time intervals on such contracted body (Chapter 28); 3) the unobserved and potentially enormous theoretical increase in the mass of such contracted body depending upon its velocity v relative to the velocity of light at c (Chapter 31), and a new relativistic formula for the composition of velocities (Chapter 29). The last five paragraphs suffice to describe Einstein’s Special Theory of Relativity in a nutshell. Since 1905, Einstein’s Special Theory has gradually become accepted by the scientific community, and it is now considered to be a ubiquitous law of physics. Many have even called it a scientific revolution. Professor Rigden recently described Special Relativity as a “super theory” and concluded that now, “any physical theory must incorporate Einstein’s relativity theory” (Rigden, p. 101). This currently is also the conclusion of most other scientific theorists. In late 1915, Einstein attempted to generalize Special Relativity to include accelerated motions and all other forms of motion, not just inertial motion (uniform velocity). This “General Theory of Relativity” resulted in many more ad hoc, unobserved and artificial mathematical consequences and speculations (Chapter 40). It also required the abandonment of Euclidian geometry and the invention of a bizarre new theory of gravity (called “curved spacetime”) in order to mathematically make his General Theory appear to work (Einstein, 1916 [Dover, 1952, pp. 111-164]). General Relativity in turn spawned Einstein’s 1917 theory of a “finite spherical universe” (Einstein, 1917 [Dover, 1952, pp. 177-188]) upon which much of current day cosmology is based. The influence of Special Relativity has also spread to other disciplines, such as philosophy, epistemology, art, and even poetry. “The theory of relativity…has become part of our culture” (Rigden, p. 102). B. Some problems with Special Relativity. So is that the end of the story? Are Einstein’s conjectures concerning Special Relativity really valid, and have they received the historical, logical and empirical scrutiny which they deserve? Hardly. One huge fly in Einstein’s relativistic ointment turns out to be: that the mathematical “difficulties” which Einstein imagined concerning Maxwell’s constant velocity of light at c and which he was attempting to reconcile with his mathematical Special Theory…did not even exist (Chapter 21D and the Preamble). There were no actual or mathematical “difficulties” that needed solving, reconciling, or Einstein’s Special Theory. They only existed in Einstein’s mind and constituted a paradox, which after sufficient analysis has the following simple explanation. Maxwell’s transmission velocity of a light ray at c in vacuo is both constant with respect to the medium of the vacuum of empty space through which it passes and becomes a relative rate of velocity when such light ray propagates over changing distances with respect to all linearly moving bodies. The algebraic values (c + v and c – v) which Einstein obtained by applying the Galilean transformation equations to a light ray transmitting at velocity c through a vacuum and propagating relative to the carriage moving inertially at v, did not result in a variation or change of the constant transmission velocity of light at c.
The algebraic values c + v and c – v were just the very natural relative velocities of a light ray constantly transmitting at c with respect to the medium of empty space as it also propagates over changing distance/time intervals (ct ± vt) relative to a material body that is moving linearly at v either toward or away from the light ray (Figures 21.1 and 21.2). 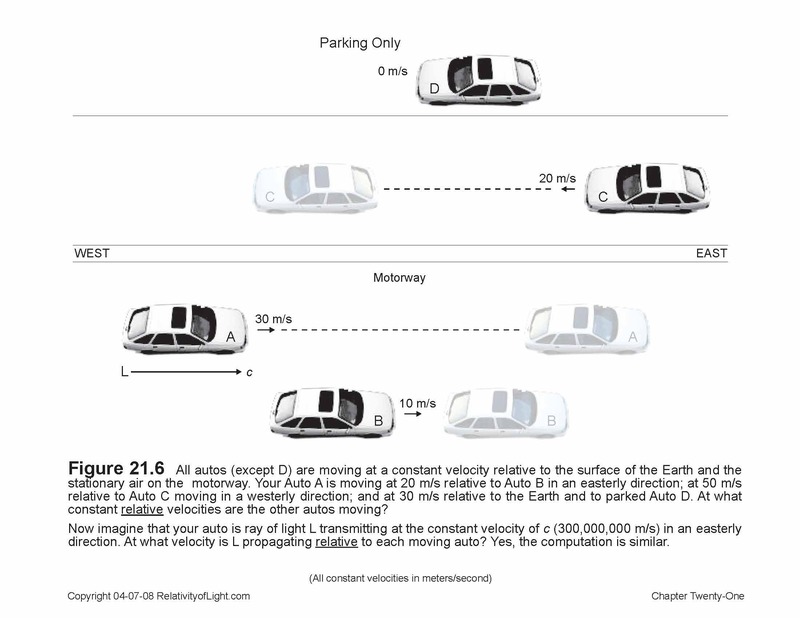 These relative velocities of light are analogous to the constant velocity of your automobile with respect to the motorway, which also has relative velocities with respect to the other autos that are passing you at different constant velocities in either direction (Figure 21.6). Einstein misinterpreted such relative velocities of light propagation (c ± v) over changing distance/time intervals with respect to linearly moving material bodies to be varying velocities for Maxwell’s constant transmission velocity of light (Chapter 21D). However, there is no specific law for the velocity of propagation of a light ray over different changing distances and time intervals and relative to linearly moving bodies. Maxwell’s constant velocity of light at c in vacuo only applies to a light ray transmitting relative to its medium of empty space (Chapter 6A). Einstein’s misunderstanding and misinterpretation of these critical facts was one major false premise for his Special Theory. There are also many others (Memo 1.1). In addition, the so-called “Galilean transformation equations” are a really a misnomer. They are really just translation equations (Chapter 14). Such transmission equations should never have been theoretically applied by Einstein to the constant transmission velocity of a light ray at c propagating relative to linearly moving bodies. Why? One reason is that such velocity of light is empirically and, by definition, constant. The velocity of light in a vacuum is always “invariant;” it never varies in the medium of empty space. An invariant quantity cannot meaningfully be mathematically transformed (changed) to a different quantity from one inertially moving body to another inertially moving body. If one attempts to algebraically transform or translate any invariant constant velocity from one inertially moving body to another with Galilean transformation equations, the result will automatically be a relative velocity (like c – v or c + v). Likewise, the Lorentz transformation equations (which were designed by Lorentz to artificially change invariant values, such as length) should never have been so applied, for similar reasons. Einstein’s assumption that either of such transformation equations could be meaningfully applied to the constant transmission velocity of light at c was another major false premise for his Special Theory. 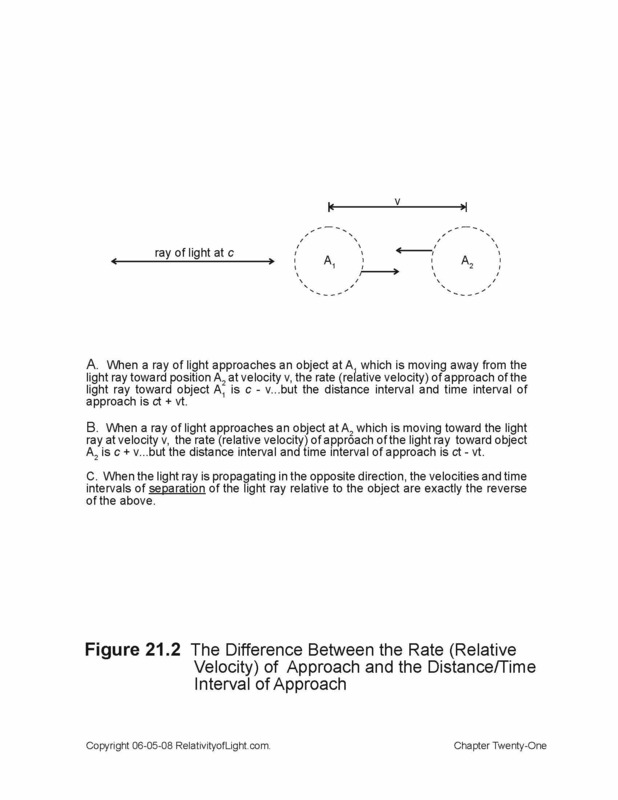 In reality, Michelson and Morley’s “missing time interval” for light propagation within his apparatus, which Einstein sought to explain by an artificial and illusionary contraction of the distance interval (Einstein, Relativity, pp. 58 – 60), is merely a paradox that is also easily explainable without any assumed contraction of matter. There are three real reasons for Michelson’s paradoxical null results: one theoretical, one empirical, and one technical (Chapters 10, 11 and 12). It also turns out that the mechanics concept of Galileo’s Relativity, in any of its many forms, is irrelevant to the constant transmission velocity of light at c, for several reasons. For example, the two concepts (moving matter and light radiation) are so different that they can never be unified or reconciled (Chapters 23 and 24). Thus, Einstein’s first fundamental postulate (his radical and expanded mathematical “Principle of Relativity”) which includes both light (EM) and optics as well as mechanics (matter in motion) is meaningless (Chapter 24). It follows from the above, that Einstein’s elaborate and contrived Special Theory, which was premised on his meaningless principle of relativity, was both unnecessary and empirically invalid from its inception. Einstein’s Special Theory is also fraught with one false assumption, interpretation, and concept after another (Memo 1.1 and Figure 1.2). Let us discuss a few specific examples. The theory falsely assumes that the non-material phenomenon of light should be analyzed and governed according to the irrelevant concepts of mechanics (Chapters 19, 20, 23 and 24). Einstein’s contraction hypothesis and his Lorentz transformation equations were merely conjectural inventions of his imagination (Chapters 10A, 15, 16 and 27). Einstein’s concepts of “simultaneity,” “common time,” “proper time,” and synchronization of clocks and events are hopelessly flawed. For instance, every human inertial observer has his own unique “personal time” for the perception of distant light events. Therefore, Einstein’s concepts of a “common local time” for all spatially separated observers and events on the same inertial frame (no matter what its size)…are invalid on their face (Chapter 25). The mathematical fix of Einstein’s Special Theory is predicated on the false premise that a propagating ray of light must always have the same absolute velocity of c with respect to every linearly moving material body, regardless of such body’s location, its different linear velocity, or its different direction of motion. This is an impossible and invalid absolute concept (Chapter 21E). For example, this result would be analogous to your automobile moving down a street at the constant speed of 30 m/s relative to the street and at the same time magically be moving at a rate of exactly 30 m/s relative to every other moving vehicle in the entire city, regardless of its location, its speed, or its direction of motion. This absolute result would, of course, be impossible (Figure 21.6). The theory falsely assumes that matter (i.e. a material body) must physically contract in size, and that the duration of time intervals on such contracted body must slow down depending upon its velocity relative to c, in order for light to propagate in the absolute and impossible way that Einstein conjectured (Chapters 20G, 26 and 28). The theory is also based upon the idea that the inertial motion of one body relative to the inertial motion of another body will, if fast enough, cause the length of each body to physically shrink down to nothing, will cause the duration of time intervals on each body to slow down to zero, and will cause the mass of each body to become infinitely large (Chapters 28 and 31). In such chapters of this treatise, it is demonstrated that all of these ad hoc mathematical predictions and consequences of the Lorentz transformation equations are nothing more than unobservable and untestable theoretical constructs. 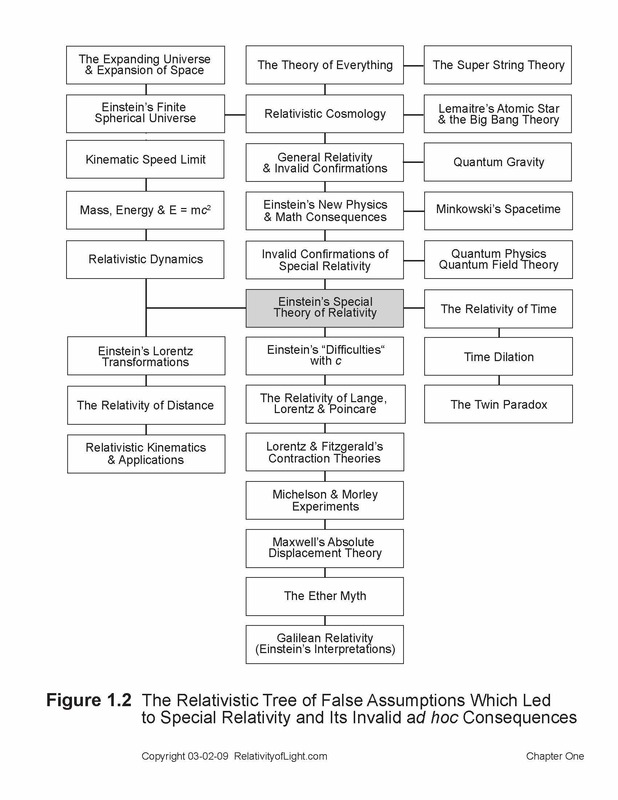 The above relativistic concepts and Einstein’s Special Theory in general have resulted in many more ad hoc, relativistic mathematical theories over the years, beginning with Einstein’s formula for E = mc2 later in 1905 (Chapter 32), and Minkowski’s Spacetime geometry in 1907-8 (Chapter 33). A short list of the others includes: Einstein’s ad hoc formula for the relativistic composition of velocities (Chapter 29), the applications of Einstein’s transformation equations to light, electricity and the Doppler effect (Chapter 30), Relativistic Dynamics (Chapter 31), quantum physics and particle physics (Chapter 34), quantum field theories and Superstring Theory (Chapter 35), many of which are also circularly considered to be experimental confirmations of Special Relativity. Throughout most of his writings on Special Relativity, Einstein was almost always talking “double-speak” in order to achieve his theoretical agenda. For example, he may have couched a measurement in the empirical terms of a human observer, a distant light flash, a rigid rod, a body of reference, a time or a distance, but he actually measured almost everything mathematically by hand and eye coordinates, by simultaneous clock times, by frames of reference, by algebraic equations, by distorting Lorentz’s transformations, by so-called “proper” measurements, or by some other method that only had meaning for him. The intended result was an air of mystery and total confusion by the reader. The dozens of so-called experimental confirmations of Special Relativity have greatly helped to turn Doubting Thomases into faithful, unquestioning believers and advocates. Yet when carefully scrutinized, it turns out that all of these so-called confirmations are in reality either coincidental approximations, rank conjectures, empirically invalid concepts, misconceptions, illogical interpretations, ad hoc mathematical consequences, circular reasoning, unmerited guesses, explainable paradoxes (such as the M & M null results), untestable speculations, wishful thinking, or the like (Chapters 36, 37 and 38). The author has also demonstrated that the remaining so-called experimental confirmations are just repetitions of the above or provably incorrect on their face, such as Einstein’s attempted relativistic confirmation of the 1851 Fizeau experiment (Chapter 29). It has been suggested by Einstein’s disciples (in order to attempt to save his Special Theory) that the contraction of matter and its reciprocal concept, the dilation (slowing down) of time intervals, which mathematical consequences are the heart of Special Relativity, are merely illusions of measurement rather than real physical processes (Resnick, 1992, p. 472; D’Abro, 1950, pp. 150 – 151; Born, p. 254). On the other hand, Einstein himself described such consequences as “physical behavior” (Einstein 1905d [Dover, 1952, p. 48]; Einstein, Relativity, p. 41). Actually, they are neither. In fact, such bizarre theoretical consequences do not exist in any form. They are only myths and illusions that mathematically result from the Lorentz transformation equations, and result from faulty analyses of hypothetical examples suggested by Einstein (Chapters 26 and 28). Again, the so-called experimental confirmations of these myths and illusions came in the form of speculative analogies to physical processes, misinterpretations of physical experiments, conjectures, and the invention of further invalid mathematical theories. Such relativistic myths are not unlike the myths of “phlogiston,” “caloric,” and “ether” previously described in Chapters 1 and 6. In fact, the mythical concepts of ether and Special Relativity are strangely similar. Both were invented in order to attempt to explain puzzling dilemmas and paradoxes. Both became almost universally accepted as valid. Both resulted in contrived theories that created more false and imagined consequences but no real solutions. Both were based on fallacious premises. Strangely enough, both are primarily absolute concepts, not relative ones. A century or so ago the false concept of ether was gradually exposed as being strictly a figment of scientific imagination, and real explanations for some puzzling phenomena emerged. When the false premises, interpretations, assumptions, concepts and consequences of Special Relativity are exposed and understood, and when the real solutions for paradoxical results, mysterious phenomena and so-called confirmations are explained…then all of the dilemmas, difficulties, illogical concepts, and imagined consequences which surround and constitute Special Relativity will also immediately disappear. C. Special Relativity as a theory of measurement. “The [Special] theory says nothing about the nature of the world. It only speaks to how measurements are made when we begin to explore questions about the world” (Ibid). “a rod in Einstein’s theory has various lengths according to the point of view [measurement] of the observer. One of these lengths, the [rest length] or proper length, is the greatest, but this does not make it more real than the others” (Ibid, p. 255). 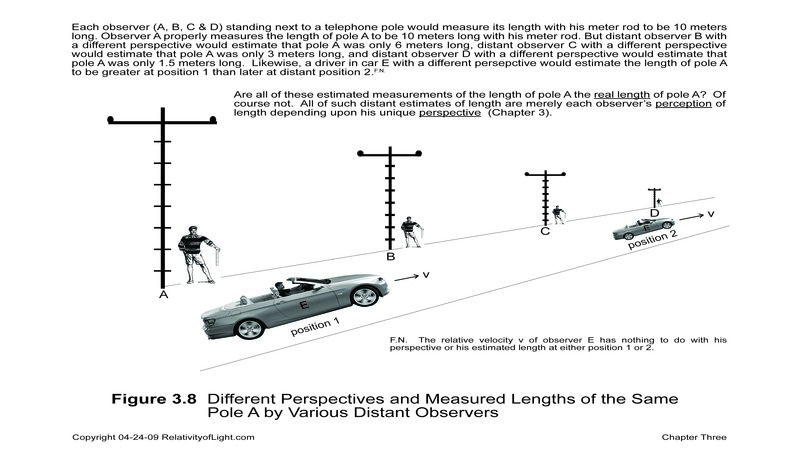 These concepts might have some validity if several human observers were estimating the length of a telephone pole from various distances away (Figure 3.8). However, Einstein (in effect) asserted and claimed that all of his estimates and mathematical measurements of length resulted in the real physical length of the telephone poles, and that such measurements depended upon the relative velocity of the measurers. “says nothing essential about the body itself, but results as an artifact of the way distances and times are measured for the same events by different inertial observers” (Goldberg, p. 141). Does the magnitude of an object or a physical phenomenon (i.e. mass) moving with respect to the observer who is measuring it…actually physically change? Goldberg replied: “Within the theory of relativity this question has no meaning. We might coin a phrase: “Actually is as actually measures’” (Ibid, p. 147). “According to Einstein, the [magnitude of any physical phenomenon changes] only in so far as it is in relative motion with respect to the observer. Were the observer to be attached to the [physical phenomenon, no change] would exist; it would be the [physical phenomenon] left behind which would now appear to have suffered the [change]. Thus mass follows distance, duration and electromagnetic field in being a relative having no definite magnitude of itself and being essentially dependent upon theconditions of observation” (D’Abro, 1950, p. 160). Resnick also attempted to describe and justify Einstein’s measurements of length: “No actual shrinkage [of the rod] is implied, [there is] merely a difference in measured results…Special Relativity is a theory of measurement that simply says ‘motion affects measurement’” (Resnick, 1992, pp. 472, 481). The author can only respond with the word: Baloney! All of the above attempted explanations, rationalizations, justifications and apologies totally ignore the following facts. Einstein intentionally conjectured ad hoc that the magnitudes of all physical phenomena (with only a few exceptions) are dependent upon relative velocity. In other words, that their magnitudes are measured (by Einstein’s ad hoc system of measurement) to change in proportion to their relative velocity. Einstein arbitrarily changed Galileo’s material concept of relativity so that it might also theoretically apply to electromagnetic and optics (Chapter 24). Einstein intentionally contrived his ridiculous kinematic system of measurement (Chapters 25 – 29) for the sole purpose of distorting most of physics, because this was the only way he could make his impossible concept for the absolute propagation velocity of light at c (Chapter 21 and the Preamble) appear to have any validity (D’Abro, 1950, p. 162). Einstein and his followers have repeatedly referred to the mathematical consequences of Einstein’s surrealistic Special Theory as resulting in new real and physical phenomena with physical meanings, and they have spent decades trying to confirm such ad hoc consequences with empirical results and artificial interpretations of experiments (see Chapters 36, 37 and 38). Many of Einstein’s followers were fully complicit with this pseudo-scientific process which now pervades most of physics and many other scientific disciplines as well. As a result, Einstein is now revered (or worshipped) as a scientific icon, and he was even named person of the 20th century by Time Magazine for inventing all of his mathematical gobbledygook. To dismiss all of the above described concocted distortions and outright misrepresentations as merely resulting from a different point of view concerning measurements not only adds insult to one’s injury…it is also a direct affront to our intelligence. The wasted resources and other damages that have already been done to physics by Special Relativity in the name of legitimate science may be irreparable. In any case, they are water under the bridge. The only current remedy is to immediately discard Special Relativity to the scientific scrap heap, along with other destructive myths such as caloric, phlogiston and ether, and to return to an empirical and logical investigation and observation of reality. The term “relativity” in it broadest sense refers to the relationship between natural laws and observers; in other words, how the laws of nature apply relative to human observers. The overriding question explored by this treatise, and in the following chapters, is: Are the laws of nature valid for every human observer regardless of his position, his time, his state of motion, or mathematics? Einstein claimed that in order for the velocity of light to satisfy the first three parts of the above test, inter alia, the following conditions must be met: Einstein’s radical principle of relativity must be applicable, his artificial concept of the absolute propagation velocity of light at c must be applicable, the dimensions of linearly moving bodies must contract, their mass must increase, and the duration of time intervals on them must become slower, depending upon the relative velocity of such bodies as compared to the velocity of light. On the contrary, it shall be a major purpose of the remainder of this treatise to demonstrate that the laws of nature have always been the same for all human observers, regardless of the relative velocities involved and without the concepts of Special Relativity. In other words, Einstein’s Special Theory was always unnecessary and irrelevant as well as invalid. Similar conclusions apply to Einstein’s General Theory of Relativity, his relativistic theories of the Cosmos, and all the other ad hoc mathematical theories described in the following chapters. This treatise asserts the following much broader, stronger, and unconditional natural principle: “THE LAWS OF NATURE ARE THE SAME FOR ALL HUMAN OBSERVERS, REGARDLESS OF THEIR POSITIONS, TIMES OR STATES OF MOTION.” We shall call this the “Universal Principle.” The Universal Principle includes all disciplines of science, and does not require any transformation equations, any coordinates, any frames of reference, any specific mathematics, nor any special hypothesis or assumptions. A “constructed theory” is one that begins with imagination and rationalizes empirical phenomena. A “principle theory,” on the other hand, begins with secure empirical foundations and deduces consequences or imagines extensions (Folsing, p. 208). We will demonstrate that Einstein’s Special Theory lacked any empirical foundations and therefore was certainly a contrived and constructed theory. The First Part of this treatise has primarily dealt with the theories, experiments and assumptions that led to the creation of Special Relativity, many of which were contrived and false. The Second Part and remaining chapters explain and scrutinize Einstein’s Special Theory itself: its many false premises, postulates and assumptions; its dubious analogies, rationalizations, measurements, strained logic and interpretations; its arbitrary claims, conjectures, and bizarre mathematical consequences; and the empirical invalidity of its so-called experimental confirmations. The remaining chapters also disclose and explain some astonishing answers to the paradoxes, misconceptions and distortions that Special Relativity creates, asserts and/or implies. The proof of these many assertions by the author lies before you, so good reading.